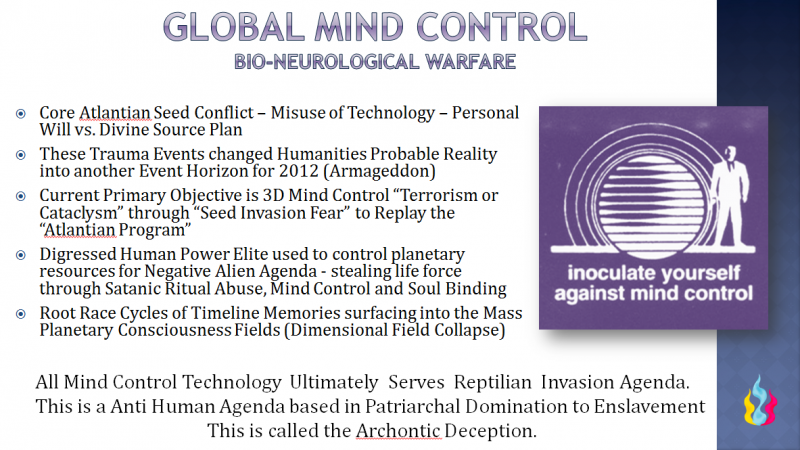 Who Built the Matrix – Global Mind Control – Alien Implants – Now We Take It Back! Whoever controls the Mind controls the body, mind and Soul. Alien Implants are used to Mind Control the masses to form socially acceptable belief systems and shape anti-human value systems which are used to condition humanity to accept spiritual abuse from the Negative Aliens and to self enforce their thought systems of hierarchical enslavement and fear. This is a divide and conquer strategy of the planet and humanity. Since most of humanity has been unable to activate the higher heart complex and connect the 4th DNA strand during adolescence and into adulthood, over the length of time the chemicals distort patterns in DNA that accumulate Miasmatic overlays on core emotional issues and physical imbalances. This is not natural. If a human being cannot activate their heart and access their 4th strand of DNA they are unable to activates their Soul identity. Thus, they are unaware of why they they incarnated on the earth, what their higher purpose is, and cannot connect to or listen to their Higher Self, because they have not activated Higher Sensory Perception abilities. Alien implants work in the human body similarly as the chemical process of geo-engineering that is spraying chemtrails in the skies to manipulate or control forces in physical matter. The construction and raw substances used in Alien Implants are vast and some unknown, they can be made of biological material, synthetic material, etheric substances in the Lightbody or programmed nanobots (Nanites) used in Artificial intelligence technologies. Alien implants are a bio-engineering technology designed to shape the human body into the Mind Control submission to NAA agendas, while chemical (nanoparticle) geo-engineering is used to control the weather by harming the ozone layer and create excessive methane gases. In both examples, when the foreign (unnatural or artificial) material is introduced to the natural body it disrupts the electromagnetic energetic balance and the homeostatic rhythm of the body. Many times it runs a low level EMF or Radio Waves signal that is designed to disrupt the human bodies natural homeostasis and electromagnetic balance. This puts the body in hyper-immunity state and/or adrenal exhaustion while fighting off the “invader”. The body develops coping mechanisms to deal with the foreign invader while extreme stress is placed on the central nervous system, brain and immune system. As with chemtrails, alien implants most generally act as a “metallic” frequency overload and exposure to impact the overall bodily energies and its auric field. Eventually this disrupts the body organism and as a result, parasites, fungi, yeast and other microorganisms become overgrown and imbalanced in the body. It is important to understand that energetic parasites (this is just one byproduct of alien implants) eventually manifest turning into a variety of physical parasites in the human body. Physical parasites impact all bodily functions, mental body functions and thought-forms, induce emotionally hysterical states, as well as promote disconnection from the inner self and spiritual energies. If the body is heavily implanted, and therefore parasitic, anti-parasitic therapy such as cleanses or fasts are highly suggested to regain energetic balance in the homeostatic organism of the entire body, mind and spirit. If you are new to cleansing please research to help inform yourself of the phases of cleansing the bodily internal organs to help you regain energetic balance and energetic health. For those of us in the Indigo and Krystal Star families, it is important to understand Alien Implants are Artificial Machinery, inorganic and is being used in the planetary field and collective mind for Mind Control purposes. The vulnerability is that “collective viral program” influencing or interfering with our personal natural bodily and nervous system processes. Mental and emotional disease creates energetic blocks which lead to physical disease patterns. Alien implants and their Archontic Deception Behaviors contribute to disease physically, emotionally, mentally and spiritually. Alien machinery and their mind control implants make us sick in a variety of ways. The purpose of the artificial cross architecture (See Crucifixion Implants)is to enslave humanity through the crucifixion and blood sacrifice of their inner spiritual being or Christ self. Religion was created by the NAA to keep these cross implants and their religious belief systems of Mind Control in place, so that, humanity would live in fear of the retribution from his False Father Alien God. This Archontic controller mechanism Archontic Deception Behavior was to keep humanity subservient to the continual feeding of their False Gods Vampires. One of the most prolific ways to feed the bloodthirsty vampires is mass killing in wars, especially in the name of God or Religious Violence. This is blood sacrifice which in all cases is Satanic Ritual Killing SRA which feeds Satanism as well as Satanic forces to spread on the earth. The NAA entities are in the majority a Satanic force, so this way of life of blood sacrifice is aligned to their vampiric killing mentality. SPE Genetic artificial intelligence AI drones or Archons sent by higher ups in the Negative Alien Agenda NAA and those that are sourced from the Imposter Spirit force. They are mind and body parasites. They are generally sent to Starseeds, Indigos to suppress them from coming online with their higher abilities. The name of the game for the NRG is propagating and feeding highly destructive addictions and deviant sexual attitudes and behavior within the global human population. This is a part of propagating the Sexual Misery program along with the Victim-Victimizer. Its first priority is designed to relegate all sexual activity laced with guilt and shame into the lowest forms of human expression and perversion possible. Depending on accepted cultural attitudes it will use the perceptive level of access to serve the current societal paradigm into distortion. (In Muslim countries it can be the Genital Mutilation, honor killings, legal killing of raped girls or women by being left in the desert to die by their own husband, or the selling of little girls to prostitution in Thailand, Catholic priest pedophilia in the Vatican, Sadistic or masochistic fetishes in Germany. These harvested sexual energies all feed back into the same NRG Grids matrix and feed the Sexual Misery programs) See NRG Implants. The Dead Light matrices also reflect the Artificially Bent Light “Holographic Inserts” (which contain the controlled versions of the nature of this reality, such as Crucifixion Implants) and these are also shattering and exploding systematically into the outer fields of the planet. These are false realities (artificial holographic inserts) that we have thought were “real” and then developed mental beliefs that held that specific version of reality and its Timelines kept in place. As these false realities are shattered into pieces (for those maintaining energetic balance in this explosive terrain), we can read the signature of those “Dead Light” pieces that reflect the nature of its disease and its schism. Holographic Inserts work like a software program. Reptilian Tail is observed as Alien Implants on the base of the coccyx which are used to stop the lower three bodies (1D-2D-3D) from forming into a merkaba spinning field which allows for drawing in higher source fields from the higher Soul planes and the Monadic planes for the spiritual Lightbody.It is designed to block Kundalini activation while feeding the lower Negative Ego mental body complex. Scalar Tagging has been used on 4D astral plane by extra-dimensionals for quite a long time. With inner vision, some versions of them may appear like dark “jacks” or “confetti” splattered around your aura field. They are something like Astral Bots that are automated to lock onto the coordinate location of a person that has been tracked or tagged. They are tracking devices, and they have a particular tone so that those on the Astral Plane can monitor the location and coordinates of that particular Starseed or Indigo or whoever that being is. Scalar Tagging can be individual to that persons history of evolution, such as there can be Lemurian Tags, Atlantian Tags, Egyptian Tags, Drakon Tags, Orion War Tags, if the person was a powerful being in that Galactic History or event, sometimes they are tagged to be monitored by NAA or military forces. The Zeta Seal is located in the Astral Plane layers of the heart complex to block activation of the 4th DNA strand which blocks access to the Mentor Fields (first layer of the higher self mind) in the 5th dimension. Essentially it is the 4D frequency fence placed in the human body to keep the human soul reincarnating in the Astral Plane under the control of the NAA during the death process. It creates a multitude of blockages that separate the heart sensory abilities from being recognized by the mental body or conscious mind. Aging Disease or Cell Death Programs, assorted implants or uploaded mental programs to activate negative labels for medical classification of diseases, rapid aging, and inability for tissues to adequately repair cellular integrity, leading to cell death. These collective consciousness disease programs are kept alive in the mass consciousness to activate diseases, implement pharmaceutical and drug dependencies, take over the central nervous system functions, while shortening healthy life spans. 666 Implant or Templar Seal– This level of the blockage and quarantine is what is referred to as the “666” seal and is a genetic block in the sixth dimensional frequency layers residing within the 6D Indigo Ray and 7D Violet Ray Monad or oversoul bodies and crown chakra which is referred to as our Wings. At the beginning of monadic level integration, this 666 Implant or Templar Seal can be removed form the human Lightbody. Metatronic Implants – are Metatronic Reversals connect to Metatronic Implants in the shadow body or Negative Form that are designed to reverse and drain life force out of the earth body and the human body. The shadow body or Negative Form must be cleared from the human Lightbody in order to reconnect the ascending potential of the twelfth dimensional template of the human body. This unnatural configuration was built by the NAA via Alien Machinery that uses Artificial intelligence to parasitize the earth’s life force to achieve immortality, and this organized structure is referred to as the Tree of Artificial Life, or the Black Tree of Life. Crown of Thorns – is designed to distort the natural energetic circuitry of the crown and block the higher self communication descending from higher dimensions being transmitted into the crown receivers. This implant acts as another frequency fence to keep humanity unable to communicate or gain access to their higher self bodies. It blocks the vertical communication channel around the head, skull and crown. Glandular System Implants – malfunctions in the path of the Kundalini rising that impact the brain receivers and the Hypothalamus, Thalamus, Pineal, Thyroid, and Thymus. During NAA invasion 5,500 years ago, the collapse of the magnetic field created DNA scrambling that removed our natural language and ability that allowed us to communicate with the entire planetary species. This interferes with the sequence of fire letters to arrange correctly in the DNA template, causing loss of species memory and language. In the bible, this is referred to as the time Yahweh deliberately confounded our species language, because humans were sinners, and as such, it is called the Tower of Babel Implant. Solar to Earth Chakra Implant – distortion in the 11D buddhic layers to interfere with the 10D communication from the Avatar self to be unable to ground into their 12D field hub or earth based chakra interface. Troubles with 12D Shielding, connecting crown to feet in vertical channel, and AI hologram spin outs of Negative Form should check for the Solar to Earth Implant or Avalon Implant. Splitter Tech is a type of AI encoding that run as a Mind Control script that is embedded into a variety of types of media, such as written words, spoken words of an infected individual, video or audio recordings, that can pass on that same scripted code to another person that resonates with that same frequency or information. It reveals a profile that is commonly observed in very academic or intellectually developed people, and tends to be attached to highly mentalized persons with dominating Negative Egos, judgmental perceptions and little to no heart opening.